Along the long and winding country roads of Inner Mongolia, strange mounds loom at the roadside, bedecked with colourful prayer flags and piled high with smooth stones. Known as ovoos or “magnificent shrines”, these sacred heaps are typically fashioned from nearby rocks, wood, and strips of colourful silk. In areas where rocks are too few, they can even be made from soil, sand, or tree branches. They vary in size and are often located in high places, such as at the top of mountains or within mountain passes. 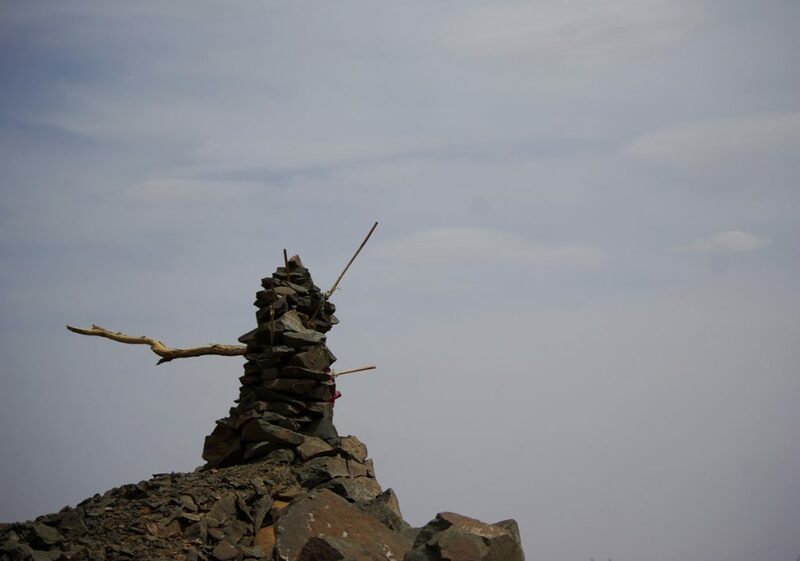 According to traditional Mongolian shamanism, each ovoo is meant to be symbolic of a deity, so there are ovoos dedicated to heavenly gods, mountain gods, gods of nature, ancestral spirits, and any otherworldly entity you could think of! Slaughtered animals, incense sticks, and libations all serve as worthy sacrifices when one is worshipping at an ovoo. If a Mongolian person happens to pass by an ovoo while traveling, it is customary to stop and circle the ovoo three times in a clockwise direction, as it is believed this will protect them during their journey. After that, it is customary to pick rocks up from the ground and add them to the pile as an offering. Anyone who is specifically seeking a blessing from the gods will leave finer gifts in the form of candy, money, milk, or alcohol. In fact, leaving an offering is such an integral part of the tradition surrounding ovoos that you’ll often find a variety of miscellaneous items underneath them, including old steering wheel covers, wooden crutches, empty liquor bottles, and even horses’ skulls! As modernity has crept in, these traditions have had to change, and it is now considered acceptable to honk your horn while passing an ovoo if you don’t have time to stop. While ovoos dedicated to the rich pantheon of deities in Mongolian shamanism tend to be for public use, those built for ancestral gods or village gods are often private shrines for a specific clan or shared by a certain village, banner, or league. 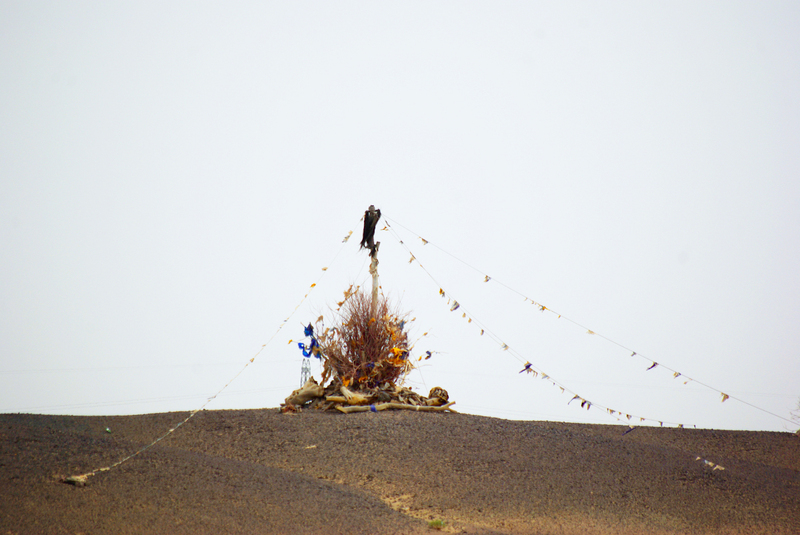 At the end of summer, ovoos become the site of Heaven worship ceremonies, where people gather to make offerings to Tenger, the God of Heaven according to Mongolian shamanism. They first place a tree branch or stick into the ovoo and tie a blue ceremonial silk scarf to it, known as a khadag. This scarf is meant to symbolise the blueness of the open sky and Tenger himself, who is regarded as the sky spirit. They then light a fire, burn incense, and make offerings of food before taking part in ceremonial dances and prayers. Food left over from the offering ceremony becomes part of a lavish feast that is shared by all of the participants. After all, maintaining that religious fervour must really work up an appetite! Shamanism: The practice of attempting to reach altered states of consciousness in order to communicate with the spirit world and channel energy from it into the real world. This can only be done by specialist practitioners known as shaman.